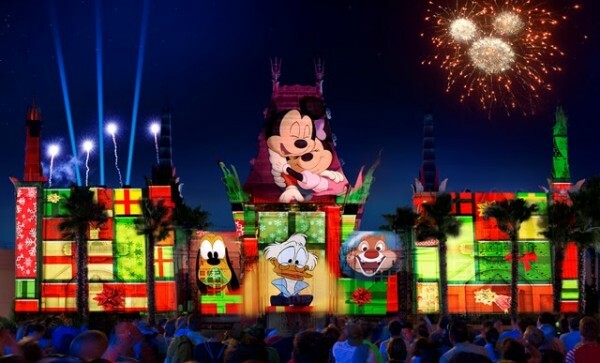 The all-new “Jingle Bell, Jingle BAM!” holiday spectacular comes to Disney’s Hollywood Studios® at Walt Disney World® Resort on November 14, 2016. Santa Claus is missing and the search-and-rescue mission to get The Big Guy back to the North Pole in time for Christmas Eve is all part of the fun. The show comes to life on, above and around the Chinese Theater with state-of-the-art projections, special effects, fireworks and a rousing seasonal musical score. A sweet way for you to enjoy this new holiday spectacular is with the Jingle Bell, Jingle BAM! Holiday Dessert Party, which includes reserved viewing, desserts, specialty beverages and more. Each dessert party guest will get a pair of 3D HoloSpex® glasses to use while watching the show. The glasses create spectacular holographic illusions of gingerbread men, candy canes, snowflakes and ornaments on any bright point of light. Memorable, heartwarming, and enchanting for the entire family, these one-of-a-kind holiday experiences will dazzle you at Disney’s Hollywood Studios through December 31, 2016. This entry was posted on October 14, 2016 at 3:34 pm and is filed under Disney News, Hollywood Studios, Walt Disney World. You can follow any responses to this entry through the RSS 2.0 feed. You can leave a response or trackback from your own site.